Ever since the 2nd century AD, the Incas in South America have been growing potatoes, known there as chunu. The potato plant grew at high altitudes (4,000 meters) in the Andes, where many other plants can no longer grow. Later DNA research has shown that all old potatoes stem from one plant from southern Peru. More than 40 potato varieties come from farmers in the Andes region. 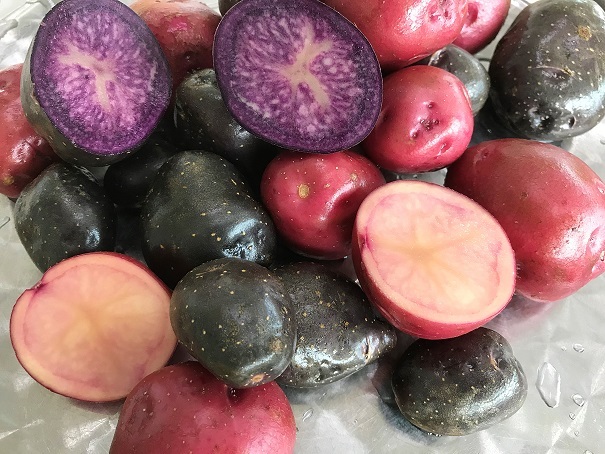 The potatoes from the Andes are very different in shape (from smooth and elongated to knobby tubers that look like giant blackberries) and colour (from bright yellow to fuchsia pink and deep purple). These colours remind us of our colourful potato mix and the Double Fun. The Incas ate the potato cooked, baked, dried and mashed. They baked bread and pie from potato flour. They even used a freeze-drying method to store the potatoes for a long time (years). The potatoes were laid in the cold air for a few nights, and in the bright sun during the day. South America was discovered by Spanish explorers in the sixteenth century. One of them took the first plant from Peru or Chile to Europe around 1530. Monks were responsible for the distribution of the potato from Spain to other European countries. The farmers initially did not want to know about the potato, because they were afraid that it would also be poisonous, just like the rest of the plant. Eventually, they found potatoes easier to grow and cultivate than other crops like wheat and oats. Most importantly, it became known that potatoes contained most of the vitamins needed for sustenance, and they could be provided to nearly 10 people for each acre of land cultivated.